At Evolve, we inspire health, happiness, and fitness from within. Through heartfelt human connection, we create body-positive transformations that reflect mental, physical, and spiritual growth. As a collective of teachers, Evolve offers our clients a path to wellness that is welcoming and judgement-free, rooted in a supportive and trusting environment. We value collaboration. We see obstacles as opportunities. And we’re committed to meeting you where you are, as you are. Evolve’s approach to wellness is interdisciplinary, personalized, and designed to help you move forward toward your unique goals at your own pace. The interplay of three transformative movement modalities. 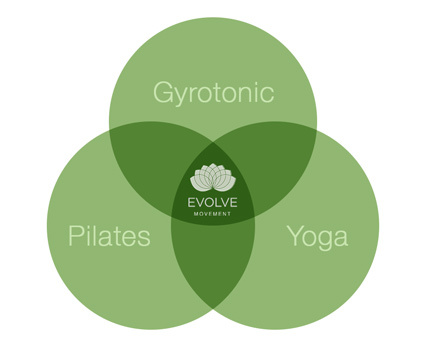 Evolve specializes in Yoga, Pilates, and Gyrotonic® techniques, which can work in combination or on their own. Our expertise offers you a one-of-a-kind opportunity to create a personalized program that draws from each practice, reaping the benefits of each. The expertise of our teachers. Our instructors are deeply knowledgeable in every technique we offer. They understand how each practice complements the others - and interacts with other activities. It’s a holistic view, informed by years of experience. Our committed team. Our instructors have dedicated themselves fully to careers in teaching movement. This is their “real job”; this is their life’s work. You benefit from their commitment to continued education and deep understanding. A personalized experience. We focus on small, personalized group classes and one-on-one sessions. At Evolve, we don’t just know your name and face - we seek to understand who you are and what you need. We offer support for all ages, abilities, and injuries; you don’t have to “jump in” at a preselected level and adjust on the fly. We’re here to listen, help you prepare, provide “homework,” and mindfully engage you with a practice that works for your body. Ongoing commitment to your personal development. We’re an education center, not a gym. Our classes follow a curriculum, helping you learn over time and build your independence. We also offer holistic enrichment (from special workshops to philosophical development), professional continuing education programs, and teacher training, ensuring that the entire Evolve community benefits from new insights and practices. A positive space for mindfulness and self-care. We consciously create and maintain an affirming, inspiring environment. We pride ourselves on exceptional professionalism and client services. The bottom line: we’ll do everything we can to make you comfortable, supported, and successful. A business that is managed by, and inspiring to, our staff. We’re a self-managed collective, meaning that our instructors retain a remarkable amount of control over their own professional experiences. This keeps them invested in, and rewarded by, their Evolve experience. That fulfillment and positive energy is shared with our clients.